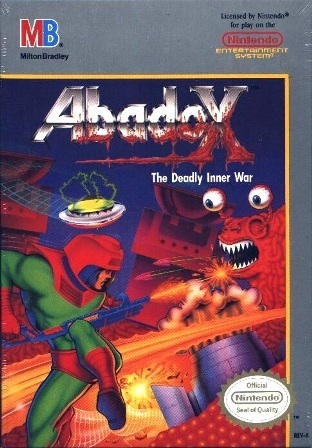 Abadox, is a video game for the NES, subtitled The Deadly Inner War. It is a side-scrolling shoot 'em up in the vein of Gradius and R-Type. The game is notable for its unique visual design, as the game takes place inside the intestinal tract of a giant alien organism. Abadox is also known to be difficult, since it takes one hit from an enemy projectile to be killed . In Abadox, if a player is killed, one must restart from a checkpoint passed before death. In the year 5012, the planet known as Abadox is soon eaten by a giant alien organism known as Parasitis. Once the planet has been consumed, the alien takes the form of the entire planet and seeks to devour other planets within the galaxy. The galactic military tries to fight the alien, but to no avail, as Parasitis destroys the entire galactic military, except for one hospital ship. It is then discovered that Princess Maria has been devoured as well. The galactic military decides to send out their best fighter, "Second Lieutenant Nazal", to attempt to enter Parasitis' body and rescue Princess Maria before it's too late. The gameplay largely follows the conventions of side-scrolling shooters of the time. The player shoots down various enemies, all of which look like various internal organs (brains, eyes and even cilia). The player can also pick weapons and power-ups. Power-ups include speed boosters, increased firepower, homing missiles and shields similar to the "Option" featured in Gradius. For weapons, the player starts with the normal single shot, but can upgrade to a 3-way gun, a spread fire gun, a laser and a hoop-like weapon. However, like most shooters, if the player is killed, all of the upgrades will be lost and the player will have to restart from the last checkpoint. In some cases, if the player dies, they may have to navigate through enemy fire with slow speed, which could prove more difficult than ever. Critics have generally looked at Abadox favorably for its design, but negatively for its high level of difficulty.